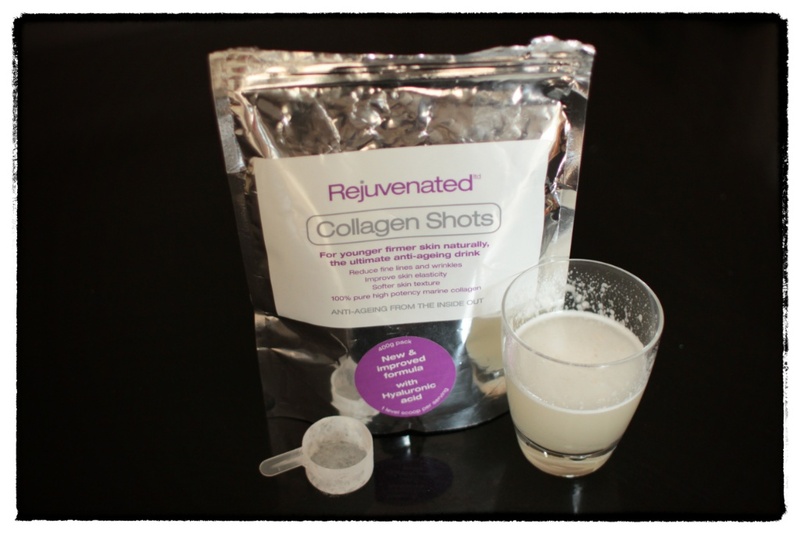 The Skin: A Collagen Shot A Day Keeps the Knife Away! Shots. A word that normally means one of two things to me. Party time! Or a trip to the doctor for vaccinations (or some fab Vit B jabs that I once had on a weekly basis whilst on a diet, but that’s a whole other story….). So all the hype on Twitter about Collagen Shots* had me well and truly intrigued. Billed as an anti-ageing drink, the shots provide the body with 10,000mgs of marine extract collagen – that’s like taking around 20-30 collagen tablets a day. All important is that it is Marine Collagen – the more commonly produced bovine collagen just doesn’t have the same results. 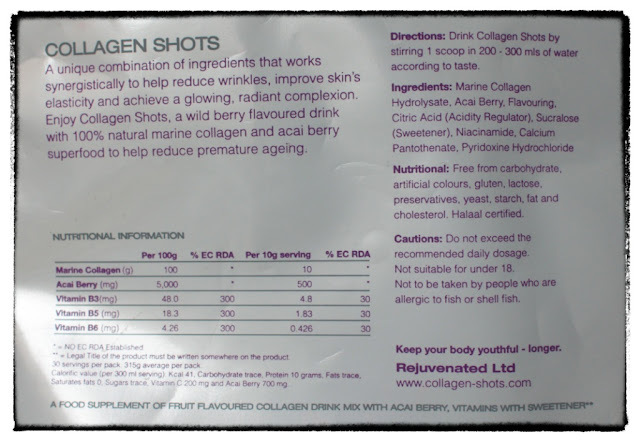 Based on the premise that as we age the collagen and elastin in our skin diminishes, (a scary 1.5% per year from the age of 25 onwards), this supplement aims to replenish the collagen and hyaluronic acid (for added skin plumpness), with a little Acai Berry thrown in for good measure to help reduce premature ageing. I just had to try these for myself. Expecting a delivery of thirty little teeny-weeny shot-sized bottles of drink that I’d down-in-one, I was chuffed to receive a resealable packet – these shots come in powdered form that you add to water – much easier to store. The pack contains exactly 30 scoops worth (the scoop comes in the pack, so you take exactly the right amount every time). It blends quite well, but I have a little trick to make sure the odd stray lump of undisolved powder doesn’t make it’s way through – I start stirring the water first, creating a little whirlpool, and add the powder as I continue to stir – nifty, eh? It tastes quite nice, a faint fruity flavour that makes it easy on the palette and it’s taken last thing at night before you go to bed, so that the Marine Collagen, Acai Berry and all the other ingredients including some of the Vit B’s can do their thing as you sleep. And the results? Well, within a week, the skin on my elbows was softer than it’s been since I was in long socks and pigtails. By the end of week two, the skin on my feet was following suit and my facial skin felt smoother, softer and I could swear those annoying little feint lines just beginning to appear under my eyes were looking like they were slowly but surely beating a steady retreat. And now, a month later, I’m well and truly hooked. There’s been a lot of to-ing and fro-ing on Twitter about whether ingesting collagen (in any form) makes any difference at all, that the enzymes in the stomach make short shrift of anything making its way into there, breaking it down to nothingness. But without trying it, you won’t know. Now that I have, I can honestly say I can see and feel the difference, so although this was a press trial, I have no hesitation at coughing up the required amount on a monthly basis. What I might do to make it more affordable (if I can kick the collagen addiction!) is take it consistently for three months to really give the hydration and collagen levels a boost, and then take it three or four times a week as a maintenance. The way I’m looking at it, it’s a darn sight cheaper than a few B52 shots and does my skin a lot more good. I’m sold. It might be a bit pricey but it beats the heck out of Botox or something similar!! And I’d always rather try a vitamin infusion than surgery.